As members of an Assault Amphibious Vehicle (AAV) crew or unit, AAV crewmen perform various duties to assist with the operation and maintenance of their vehicles and the up-gunned weapons station. AAV crewmen prepare AAVs for the tactical employment of troops and equipment during ship to shore movement and the resulting operations ashore. Categorized as a military occupational specialty (MOS) 1833, this job is open to ranks ranging from private to master gunnery sergeant. It's considered a primary MOS (PMOS). In the Marine Corps, the EFV is a key part of many tactical deployments. These vehicles are designed to attack from the water on an enemy position on a shoreline. They approach from within the well decks of Navy assault ships and are highly mobile. These are the vehicles that transport Marines and their cargo through hostile territory so they arrive safely and succeed in their missions. The military renamed the AAV as the Expeditionary Fighting Vehicle in 2003, but that intended replacement was canceled before it was deployed. 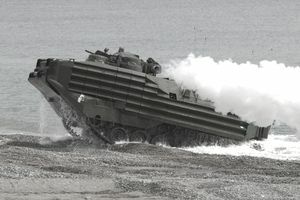 The Marines now refer to AAVs as Amphibious Combat Vehicles. The Marines who staff these specialty vehicles have a wide variety of duties related not only to weapons and combat but maintenance and upkeep of the vehicles themselves. These Marines conduct preventive maintenance checks and services on weapons. They conduct preventive maintenance checks and assist with weapons stations, installing weapons and loading weapons. To qualify for this job, you need a score of 90 or higher on the general technical segment of the Armed Services Vocational Aptitude Battery (ASVAB) tests. You have to have a class 2 swimmer qualification and vision correctable to 20/40. Normal color vision is also required. After completing basic training (boot camp) at Parris Island, you'll complete the Assault Amphibian Crewman course at Camp Pendleton in California. Section leaders, ranking from staff sergeant to sergeant must complete the Assault Amphibian Unit Leader Course at Camp Pendleton.